Arizona walked off with a 4-3 win over Cincinnati on a 10th inning single from the bat of Chris Owings. With the bases loaded and one out, B1 Owings hit a fly ball to deep left-center field, allowing baserunner R3 Paul Goldschmidt with R1 Jake Lamb and R2 David Peralta joining their Diamondbacks teammates in celebrating on the infield. Noticing that something was afoot, Reds second baseman Brandon Phillips ran toward the outfield to retrieve the game-winning ball, which had come to rest along the outfield wall. A Chase Field security guard walking along the warning track in center field retrieved the ball and threw it to Phillips, who threw onto Billy Hamilton, who stepped on and tagged second base before throwing the ball to Joey Votto who tagged first base, and onto Ivan de Jesus Jr. who tagged third base as Manager Bryan Price discussed the play with crew chief Larry Vanover, and umpires Vic Carapazza, Brian Knight and Adam Hamari. Replays indicate that although B1 and R3 touched first base and home plate, respectively, R1 and R2 failed to touch second and third base, respectively, while several Reds players, led by Phillips, remained on the field in fair territory throughout the entire play. 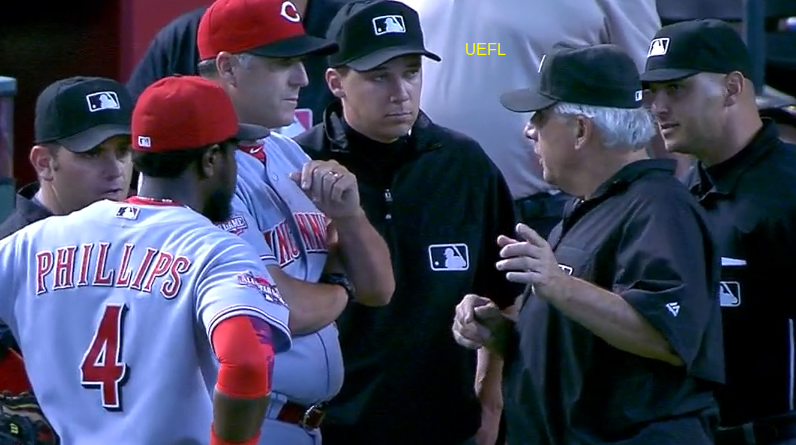 After the game, Vanover referenced Rule 4.09(b) regarding end-of-game situations (batter touches first base and runner touches home plate), said that Cincinnati was unable to retrieve the ball and tag second and third because "they didn't play the ball [and] were leaving the infield," and that ballpark personnel handling the ball in the outfield "doesn't matter because the game's over when the guy on third touches the plate and the batter runner touches first." Case Play Question, 2015-07: Was Vanover's explanation correct regarding the Diamondback's winning play or should the score still be tied? If Arizona won the game, was it due to a Chris Owings single or a fielder's choice? What rule(s) govern this scenario and does the ball remain alive throughout this play? If it becomes dead, when does this occur? If a runner or runners are to be declared out, who are they and how should play proceed? Case Play Answer, 2015-07: MLB interpretation of 4.09(b) is that the game is over when the batter has touched first base and the runner has touched home; both of these events occurred, meaning the game was over.